The second edition of Afropixel festival was held in Dakar at Kër Thiossane, in connection with the Dak'Art biennale. 'Kër' means "house" in Wolof (language widely spoken in Senegal) and 'thiossane' refers to traditional Senegalese culture. The story of Kër Thiossane is intertwined with the personal stories of Marion Louisgrand Sylla et Francois Sylla, founders of this Villa for Art and Multimedia. Francois Sylla is a musician. 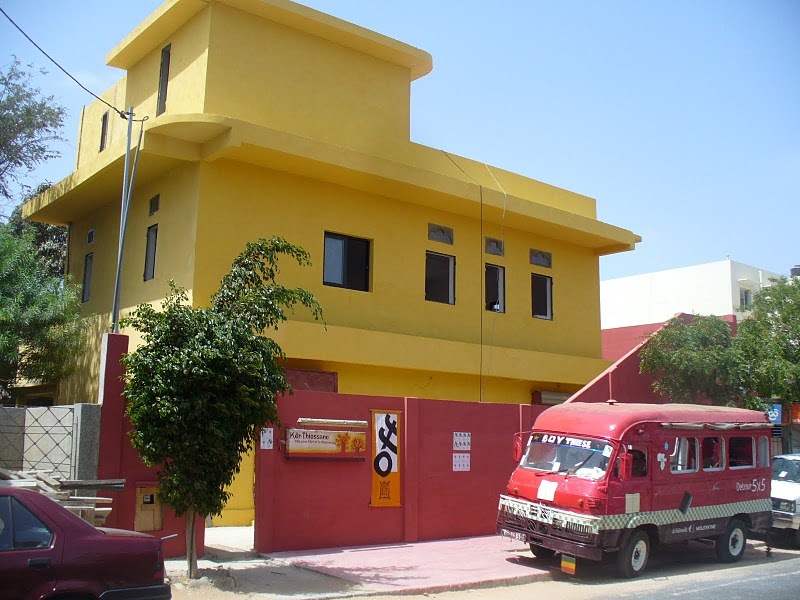 He grew up in the Villa, and always wanted to make it a space for art and culture strongly anchored in the neighbourhood of Sicap. That is why about 10 locals from Sicap were involved in the organisation of Afropixel 2010. Links to the local community have also been made by the Villa's artists in residence. One of this years guest artists, Audry Liseron-Montfils (Guyane/Belgium) worked for instance with a weaver next door. In 2008 Shaina Anand and Ashok Sukumaran (India) set up a micro radio and cinema on the N'Gellaw market close by. Kër Thiossane crosspollinates Senegalese traditions with influences from the rest of the world. Marion Louisgrand-Sylla worked a long time in Paris at Mains d'Oeuvres (cradle of the Mal au Pixel festival) on the development of the TransEuropeHalles network, that brings together independent cultural centres, most of them located in buildings from industrial heritage, and operating at the crossing of art and society. Later on within the context of Artfactories and the programme "In and Out of Europe", Marion was involved in exchange projects between informal art spaces in Africa and Europe. After meeting Francois, the idea of Kër Thiossane came along naturally. The activities of Kër Thiossane started in 2002 with the aim to provide African artists with access to multimedia tools and with support from Fondation Langlois. At the time, there was already a large amount of cyber cafes in Senegal, and generally speaking, Senegal has been doing quite well in terms of new technologies as compared to the rest of Africa. But still today there is no department for digital art at the National School of Arts in Dakar and people mostly 'consume' the internet. Ker Thiossane wanted to propose another approach to media and technology, emphasizing them as tools for knowledge that can be appropriated, and support the development of African multimedia creations on the internet. "Technology doesn't prevent tradition from existing, it's the encounter between the two that is interesting" says Marion. Since 2002, Kër Thiossane has organised various workshops bringing together new technologies and traditional creative disciplines (dance, textile design etc) and has hosted several production residency projects. In 2008, Kër Thiossane organised the first edition of Afropixel, which became the new African node in Pixelache network. As a space where critical and unconventional ways for people to take part in the development of media and technology can be experimented with, Pixelache seemed very interesting and relevant for the Villa. In addition, Kër Thiossane has early on been involved in and relying on different networks, including TransEuropeHalles. Until last year the Villa had been open on and off, due to a lack of consistent resources, but the work achieved since 2002 gained Kër Thiossane credibility. It made it possible for them to receive funding from the European Union for the first time, to develop the 2-year project "Rose des vents numériques', that opens up the network to other independent multimedia art centres and artists in the rest of Africa and the Caribbean. That is how Afropixel 2010 brought together an amazing mix of organisations and artists from Senegal, Mali, Congo, South Africa, Marocco and the Martinique along with other guest from Europe and the USA.